Justin Shears, 33, of Lima, appeared in Allen County Common Pleas Court on Tuesday in an attempt to have his court-appointed attorney removed from the case. Instead, Shears is facing charges of aggravated robbery with a firearm specification, felonious assault with a firearm specification and having a weapon under disability in connection with a Sept. 20, 2017, incident at Marko’s Bar on South Main Street that left a Lima man injured. 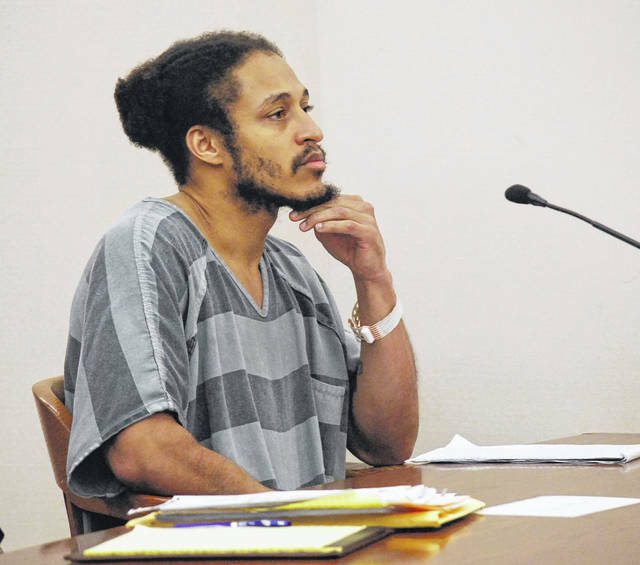 LIMA — A Lima man police say pistol-whipped his victim during a 2017 robbery attempt on Tuesday tried to have his second court-appointed attorney removed from the case. He was unsuccessful in that attempt. Not only did Allen County Common Pleas Court Judge David Cheney overrule a motion filed by Justin Shears seeking to have attorney Greg Donohue taken off the case, the judge ordered Shears to cease and desist in his solo filing of what has become a litany of motions associated with the case. “I hereby order that Mr. Shears is not to file any more pro se motions [Latin for ‘on one’s own behalf’] and that Mr. Donohue will not be removed from the case,” Cheney said. Assistant Allen County Prosecuting Attorney Jana Emrick earlier in the hearing had asked the judge to consider the numerous “improper” motions filed by Shears. Among the motions filed by the defendant was one which Donohue said may have merit. Shears, 33, is facing charges of aggravated robbery with a firearm specification, felonious assault with a firearm specification and having a weapon under disability in connection with a Sept. 20, 2017, incident at Marko’s Bar on South Main Street in Lima. Lima police were dispatched to the bar in response to the report of an alleged assault and found the alleged victim, Hubert Hankison, with multiple wounds on his head after being pistol-whipped, according to court documents. Witnesses told police Shears approached Hankison and struck him in the back of the head with a revolver. The victim fell to the pavement and Shears reportedly attempted to remove items from Hankison’s pockets, witnesses said. Shears reportedly threatened Hankison by threatening to shoot him before fleeing the scene. He was identified through security camera footage but eluded police until earlier this year. Shears on Tuesday — and in previous motions he filed— questioned the validity of the surveillance camera video, claiming the evidence had been tampered with. Cheney said the video would be reviewed at a motion hearing scheduled for Sept. 27. Shears faces a maximum of 28 years in prison if convicted on all charges. https://www.limaohio.com/wp-content/uploads/sites/54/2018/09/web1_Justin-Shears-..-Sept.-11.jpgJustin Shears, 33, of Lima, appeared in Allen County Common Pleas Court on Tuesday in an attempt to have his court-appointed attorney removed from the case. Instead, Shears is facing charges of aggravated robbery with a firearm specification, felonious assault with a firearm specification and having a weapon under disability in connection with a Sept. 20, 2017, incident at Marko’s Bar on South Main Street that left a Lima man injured.